Planning and assessment practices are essential ingredients of challenging, comprehensive, intentional teaching. Assessment is an essential part of teaching and learning. It comes in many forms. There are informal and formal methods. Assessments occur before, during and at the end of teaching and learning. Assessment should be a natural element of any educator's practice. It makes sense to ascertain interests, skills, relevance and progress before we teach, as we are teaching, and after the teaching is done. The information garnered from assessments guide educators in selecting content and activities and it helps teachers determine what skills to teach and how to teach them. That said, we live in an era of high-stakes testing, which can leave a bad taste in the mouth, so to speak. Such tests do not necessarily provide teachers and learners with data in a timely manner that can be used immediately to improve and target teaching. Nor do these tests elicit information that is specific enough to directly impact what teachers need to focus on in the present and upcoming units. Often, these tests dictate what is taught (in a narrow sense) rather then inform quality teaching. Resource/Environmental Assessments, which help us determine whether we have all the materials that we need to carry out the learning. We shouldn’t see these forms of assessment as rigid, though. They should be part of the fluid landscape of a teacher’s relationship with his or students, colleagues, classroom, school, community and subject matter. Having a conversation with a learner about their interests can be a form of a diagnostic assessment. Keeping a portfolio of a leaner’s writing can be a way of tracking formative assessment. Providing “in-time feedback” as a learner is performing a task (e.g. solving a math problem or reading out loud) is a form of assessment, practice and correction. And arranging a discussion with learners to talk reflectively about topics, about the teaching and about the significance of the learning is a way of assessing both teaching and learning. Before: what do I know about this learner (e.g. skills, knowledge, interests, etc), so I can best target my teaching and set quality goals? what are the learner’s strengths? what are weaknesses? During: how are the learners going? how do I know they are learning? how do I know if they are on track? what should the learners be achieving at this stage? do I need to provide extra support? or do I need to extend their learning? Near the End: how do I know that a learner has consolidated this stage of learning? what does the learner need to demonstrate? Are we ready to move on? Throughout: am I covering everything that needs to be covered? is my teaching comprehensive? are there any gaps? do I need extra support? Throughout: what has been made available for learners? are we using resources wisely? is there anything further that needs to be made available? have I chosen the right topic? the right reading and writing material? Continually improving and adjusting practices, which allows teachers to be more confident and knowledgable. In other words, the goal is informed teaching. In this scenario, teachers and schools develop pictures of successful learners, draw up plans, coordinate delivery, monitor progress and revise teaching as new assessments/observations are made. This is exemplified in the Staircase Curriculum (or Standards Based Change) Model promoted by Kathryn Au and Taffy Raphael. Relevant readings by Au and Raphael can be found at the Whole School Reading List here and through the SchoolRiseUSA website. These perspectives are also very consistent with four of the previous sections on this website: Balancing Instruction, Stages of Development, Establishing Practices, and Developing Constrained Skills. Strong assessment practices do require professional expertise and decision-making within schools and they often require the support of specialists outside of schools. They require diligence, thoughtfulness, collaboration and creativity. When these practices are not in place, teaching and learning can often become fragmented, inefficient and lack direction. Kids get left behind, and disadvantages becomes exacerbated over time. If we set clear, challenging goals based on strong information, then we can scaffold the many steps required to march toward our learning goals in a timely manner. Along the way, it is often the case that learners surprise us, transform us and exceed our expectations. Some of these skills are mastered early on in a learner’s journey, such as concepts of print and phonological awareness, and others are developed throughout a learner’s lifespan, such as oral language skills, writing skills, knowledge and comprehension. This dichotomy is known as the constrained skills theory (Paris, 2005). Constrained skill theory states that literacy development involves the development of two types of skills: constrained skills and unconstrained skills. Constrained skills includes things like print awareness, phonemic awareness, alphabetic knowledge, spelling, and fluency. These skills are also referred to as print-based or decoding skills, even though phonemic awareness is a pre-print or, rather, language processing skill. The aim of instruction is to achieve ‘mastery’ of these skills (in a relatively short time frame), so that learners can engage deeply and fluidly in intentional, imaginative reading and writing practices. Constrained skills are necessary, though not sufficient, for full literacy. They are best taught and assessed systematically as part of comprehensive language and literacy program. Unconstrained skills refer to growth in meaning-based skills such as oral language, vocabulary, comprehension, writing/composition, critical thinking skills and general knowledge. These skills are developed across one’s lifetime and become more complex in adolescence and into (young) adulthood. In fact, it has been found that oral language skills are a better indicator of later progress in reading comprehension than word reading (decoding) skills. Word reading (decoding) skills influence reading achievement up to Second Grade; whereas one’s sophistication in oral language ability has a greater bearing on reading (comprehension) ability from Fourth Grade and onward. When one controls for decoding skills (i.e. select individuals who have all developed decoding skills to an adequate level), then unconstrained skills, such as oral language skills, size of vocabulary and depth of background knowledge, all influence one’s ability to comprehend a text. For one to develops these skills, one requires meaningful routines and opportunities to practice in authentic circumstances across all years of schooling. As a result, assessments must seeks to understand a learner’s development in both constrained and unconstrained skills, even if constrained skills are easier to test (Paris, 2010). The diagram to the right seeks to represent this relationship schematically (select the image to expand). The left side of the “A” includes the elements contributing to oral language comprehension (unconstrained skills); whereas the right side the of the “A” includes the components that lead to robust decoding skills (constrained skills). The second diagram (below) provides constrained and unconstrained skills along a spectrum. The third diagram (also below) provides a visual timeline of the development of literacy-related areas. In this final diagram, one should notice that constrained skills must optimally be mastered in the earlier years of education (e.g. by 9 - 10 years old) to make way for more demanding reading and writing activities from late primary school and into high school and beyond. The fourth and final image (sourced from McKenna & Stahl, 2015), represents constrained skill theory across three levels: constrained skills, such as phonemic awareness, decoding, and fluency practice; vocabulary knowledge, background knowledge and knowledge of text structures; and strategic knowledge (e.g. how to read/write in different ways for different purposes). Approaching assessment can be fraught with challenges. When we choose a particular approach, we need to be conscious of the implications of our practice. For instance, there is a growing and - at times - healthy desire to use clear, targeted assessments that monitor the underlying skills which will manifest themselves in full, robust literacy practice. This is an approach adopted by McKenna and Stahl’s Assessment for Reading Instruction (3rd edition). For instance, an individual might begin by ticking off constrained skills that were mentioned in the previous section. Starting with concepts of print, the teacher might use Clay’s An Observation Survey of Early literacy Achievement to map print awareness. Then, the individual might progress through simple phonemic awareness, phonics, decoding, spelling and fluency tests. For reading, the individual might turn to the Qualitative Reading Inventory. In short, the individual is gaining a clear picture of the learner’s potential for reading based on insights gained through the foundational components of reading. 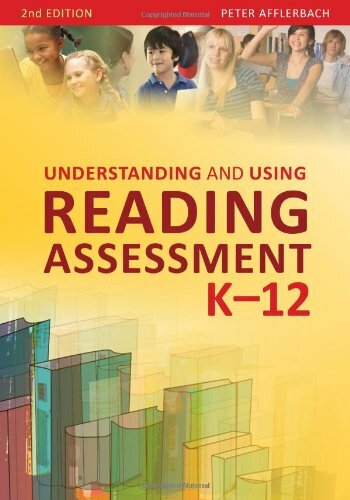 In Understanding and Using Reading Assessment: K-12 (2nd Edition), Afflerbach takes a different approach and one that is more familiar to teachers. In this text, Afflerbach places a greater emphasis on how a teacher judges what a learner demonstrates in authentic literacy tasks. Afflerbach speaks about portfolios, performance measures, reading inventories and the teacher’s targeted questions. If we read between the lines, Afflerbach is prompting teachers to base their judgements upon a student’s corpus of work, his/her interactions in the classroom and his/her responses to carefully selected instructional questions. Whilst McKenna and Stahl’s approach might be clearer, less ambiguous and more linear, Afflerbach’s approach focuses on actual, contextualised literacy practices that children engage in. One approach should not exist to the exclusion of the other, though. And both approaches turn our attention to assessing affective skills like motivation, interests and self-concept, which all have a profound bearing on reading performance. The summary of the two approaches provides only a rough outline of their perspectives on the topic, and I encourage readers to explore both books in greater depth if they have the chance. Both approaches attempt to view assessment within the realistic contexts of schools. They recognise the time constraints that teachers are under and they acknowledge how testings is gradually encroaching on valuable teaching time. That said, if we are to prepare learners for the present and the future, we need to teach effectively, comprehensively, creatively and strategically. The following provides an index of assessments which have been categorised by the skills that they assess. Please explore and enjoy! Assessment schedules should include a mixture of methods, such as "benchmarking tools" (like the ones listed below), teacher-generated assessments and routine observations (including portfolios). The following are a sample of assessment tools in main areas of teaching and learning. Some of the assessment are quite involved and require specialist to administers; whereas, others are easier to administer, score and interpret. The Continuum of Literacy Learning (K-8): Behaviours and Understandings to Notice, Teach and Support. Assessments should inform teaching and the content that we select to teach. Too often, assessment is seen as something that occurs only at the end of a unit. However, if we gather important baseline data, then we can teach in a much more informed manner. We can target skills and avoid unnecessary instruction. This information does not lead to a smooth road, though. A teacher is required to be ever-vigilant in making everyday decisions and in orchestrating a range of scaffolded activities. Teachers need to be organised, creative, caring and insightful. The more we know about our students and how they are progressing, the better equipped we will be in helping them on their respective journeys in becoming imaginative, critical and effective readers and writers. Afflerbach, P. (2012) Understanding and using reading assessment: K-12 (2nd Ed). Newark, DE: International Reading Association. Dickinson, D. K., McCabe, A., & Sprague, K. (2001). Teacher Rating of Oral Language and Literacy (TROLL): A Research-Based Tool. CIERA Report #3-016. Ann Arbor, MI. Gove, A., & Wetterberg, A. (Eds.). (2011). The Early Grade Reading Assessment: Applications and Interventions. Raleigh, NC: Research Triangle Institute. Hoffman, J. V., Sailors, M., Duffy, G. R., & Beretvas, S. N. (2004). The effective elementary classroom literacy environment: Examining the validity of the TEX-IN3 observation system. Journal of Literacy Research, 36(3), 303-334.
International Reading Association (2013). Formative assessment: a position statement of the International Reading Association. Newark, DE: IRA. Justice, L. M. (2006). Evidence-based practice, response to intervention, and the prevention of reading difficulties. Language, Speech, and Hearing Services in Schools, 37(4), 284-297. Lesaux, N. K., & Marietta, S. H. (2011). 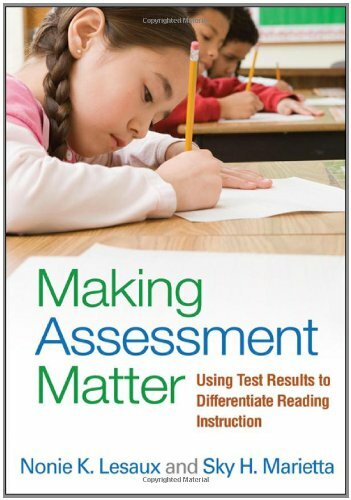 Making assessment matter: Using test results to differentiate reading instruction. New York: Guilford Press. Leslie, L. & Caldwell, J. S. (2010). Qualitative Reading Inventory (5th edition). Boston: Pearson. McKenna, M. C., & Stahl, K. A. D. (2015). 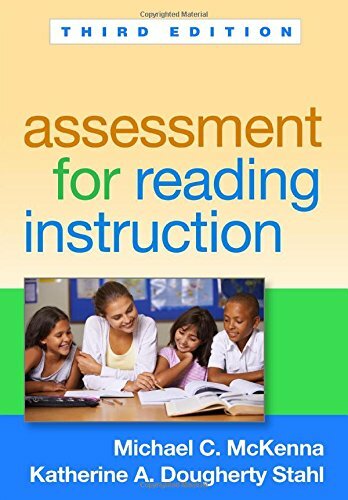 Assessment for reading instruction (ebook) (3rd ed.). New York: Guilford Press. Morsy, L., Kieffer, M., & Snow, C. (2010). Measure for Measure: A Critical Consumers’ Guide to Reading Comprehension Assessments for Adolescents. Final Report from Carnegie Corporation of New York’s Council on Advancing Adolescent Literacy. Carnegie Corporation of New York. Moss, P., Pullin, D., Gee, J. P., Haertel, E., & Young, L (Eds.) (2008), Assessment, equity, and opportunity to learn. Cambridge: Cambridge University Press. Shanahan, C. (2005). Adolescent Literacy Intervention Programs: Chart and Program Review Guide. Naperville, IL. Shepard, L. A. (2005). Linking Formative Assessment to Scaffolding. Educational leadership, 63(3), 66-70. Swanson, E., & Vaughan, S. (2011). Implementing a response to intervention model to improve reading outcomes for all students. In What research has to say about reading instruction (4th ed., pp. 266 – 285). Newark, DE: International Reading Association. Westberg, L., McShane, S., & Smith, L. (2006). Verizon Life Span Literacy Matrix: Relevant Outcomes, Measures and Research-based Practices and Strategies. Washington D.C. Au, K. H.-P. (2006). Schoolwide change to improve literacy achievement. In Multicultural issues and literacy achievement (pp. 173–194). Mahwah, NJ: Lawrence Erlbaum Associates. Au, K. H.-P. (2010). Real schools, real success: a roadmap for change. Reading Forum New Zealand, 25(1), 25–35. Au, K. H.-P. (2013). Helping high schools meet higher standards. Journal of Adolescent & Adult Literacy, 56(7), 535–539. Au, K. H.-P., Raphael, T. E., & Mooney, K. C. (2008). Improving Reading Achievement in Elementary School: Guiding Change in a Time of Standards. In S. B. Wepner & D. S. Strickland (Eds. ), Supervision of Reading Programs (4th ed., pp. 71–89). New York: Teachers College Press. Au, K. H.-P., Strode, E. V., Vasquez, J. M., & Raphael, T. E. (2014). Improving literacy achievement in elementary schools: the standards-based change process and the common core. In S. B. Wepner, D. S. Strickland, & D. J. Quatroche (Eds. ), The Administration and Supervision of Reading Programs (pp. 74–83). New York: Teachers College Press. Denton, C., Bryan, D., Wexler, J., Reed, D., & Vaughn, S. (2007). Effective Instruction for Middle School Students with Reading Difficulties: The Reading Teacher’s Sourcebook. Dallas, TX. Grant, P. A., South Australian Primary Principals Association, & Dept of Education and Children’s Services. (2003). Nothing left to chance: Report on literacy and numeracy outcomes evaluation in high achieving disadvantaged schools. Adelaide. Irvin, J., Meltzer, J., & Dukes, M. S. (2007). Develop and Implement a Schoolwide Literacy Action Plan. In Taking Action on Adolescent Literacy. Alexandria, VA: Association for Supervision and Curriculum Development. Jensen, B., Farmer, J., Hunter, J., & Cooper, S. (2014). Turning around schools: it can be done. Carlton, VIC. Mosenthal, J., Lipson, M., Mekkelsen, J., & Thomspon, E. (2003). The Dynamic Environment of Success: Representing School Improvement in Literacy Learning and Instruction. In Paper presented at the National Reading Conference. Raphael, T. E., Au, K. H., & Goldman, S. R. (2009). Whole school instructional improvement through the standards-based change process. In J. Hoffman & Y. Goodman (Eds. ), Changing Literacies for Changing Times (pp. 198–229). New York: Routledge/Taylor Frances Group. Raphael, T. E., Au, K. H., & Popp, J. S. (2013). Transformative practices for literacy teaching and learning : a complicated agenda for literacy researchers. In S. Szabo, L. Martin, T. Morrison, L. Haas, & L. Garza-Garcia (Eds. ), Literacy is transformative: 35th annual yearbook of the association of literacy educators and researchers (pp. 9–32). Louisville, KY: Association of Literacy Educators and Researchers. Raphael, T. E., Weber, C., Goldman, S., Sullivan, M. P., & George, M. (2005). Defying gravity: literacy reform in urban schools. Journal of Literacy Research, 37(3), 267–286. Swanson, E., & Vaughan, S. (2011). Implementing a responsive to intervention model to improve reading outcomes for all students. In What research has to say about reading instruction (4th ed., pp. 266 – 285). Newark, DE: International Reading Association. Taylor, B.M., Pearson, P. D., Clark, K., & Walpole, S. (2000). Effective schools and accomplished teachers: Lessons about primary-grade reading instruction in low-income schools. Elementary School Journal, 101, 121-166. Tunmer, W. E., Chapman, J. W., Greaney, K. T., Prochnow, J. E., & Arrow, A. W. (2013). Why the New Zealand national literacy strategy has failed and what can be done about it: evidence from the progress in International Reading Literacy Study (PIRLS) 2011 and Reading Recovery Monitoring Reports. Weber, C. M., Raphael, T. E., Goldman, S. R., Sullivan, M. P., & George, M. (2009). Literacy coaches: multiple issues, multiple roles, multiple approaches. Elementary School Journal, October.